Walks and Walking: Walking from the Brecon Mountain Railway to the Taf Fechan Reservoir, 5.5 Miles Easy Walking in the Brecon Beacons. The weather was cold but clear for this trip so hats, gloves and windproof jackets were the order of the day. 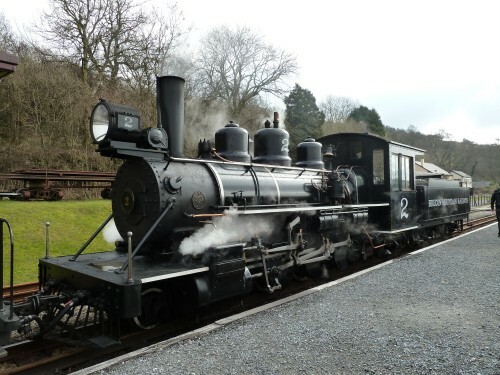 We travelled up to the Brecon Mountain Railway from our apartment in the Swansea Marina. It took about an hour in the Vito Sport, which is the perfect vehicle to throw all your gear in the back and enjoy the drive. Even the 275 mile journey from London to Swansea yesterday was really comfortable! First, we booked our tickets for the railway trip which takes you from Pant Station to a temporary terminus where the train engine turns round and takes you back to Pontsticill Station for a 25 minute break. The total journey time was about an hour and cost £40 for 4 adults and is well worthwhile as it is a great day out with plenty of refreshments and facilities, all immaculately maintained. For the first 600 yards the line which is built to the narrow gauge of 1′ 11 3/4″ follows a totally new alignment some of which was cut through solid rock. On the hills beyond the gorge can be seen Vaynor Quarry from which most of the track ballast for the Brecon Mountain Railway was obtained. Across the valley, forward of the train as it passes a disused quarry can be seen the village of Pontsticill. The train now enters a wooded cutting crossing several streams which tumble down the rocky hillside. On leaving the cutting the Taf Fechan Reservoir comes into view for the first time with as a backdrop the three peaks of the Brecon Beacons. The middle Peak is Pen-Y-Fan which at 2906-ft is the highest peak in South Wales. To the left is Corn Du and to the right Y Cribyn. As the train approaches Pontsticill Station the Reservoir Dam can be seen. The Reservoir was completed in 1927 and can hold 3,400 million gallons of water. The water flooded the vicarage and 15th Century Capel Taf Fechan, Bethlehem Congregational Chapel, some cottages, small holdings and land belonging to eight farms. In times of drought the remains of some of these buildings appear above water level. The area is ideal for walking or for simply spending some time taking in the marvellous scenery so I changed out of my walking shoes and put my walking boots on. Leave the station by the gateway at the bottom of the ramp and continue straight ahead along the road to the start of the dam. Turn right across the dam, joining the Taff Trail and follow the road around to the left until you reach a road junction. Turn sharp right and follow the road. The road climbs gently up hill, with trees appearing first on the right and then on the left. About 30 yards after entering woodland completely, fork left onto a wide forest track, signposted Taff Trail. Follow the path for 1.1/2 miles to a waterfall on a stream, bear right and proceed down hill through the forest. On reaching the road bear left and continue to the road junction. At the junction continue straight ahead, leaving the Taff Trail and cross the dam of the Pentwyn reservoir, continue along the road until reaching the railway over bridge. Immediately before reaching the bridge turn right onto the bridleway which drops to the shore of the reservoir. Continue on the bridleway close to the railway boundary fence until reaching Merthyr Tydfil Sailing Club. Continue straight ahead along the track way adjacent to the reservoir. Follow this route until reaching the outward route at the Pontsticill station gateway. Turn sharp left through the station gateway. After our visit we then jumped back in the Vito Sport and headed to the nearby Penderyn Distillery who make the only Welsh Whisky available as well as Brecon Gin. Both of which are absolutely delightful! !